Pika Works licenses the use of designs and photos seen throughout this web site. The bright and cheerful designs lend themselves to many products related to fun living, the outdoors, and kids of all ages. The prints have been very popular with young mothers for their children. They would be great on t-shirts, bedding for kids, posters, rag rugs and more. The most popular designs are Moonlit Molly, Zany Zebra, and Geraldine Giraffe. The others rank close behind. The original paintings are 11" x 15.5" acrylics by Joan MacKenzie. They are available as .eps and .tif files. Molly is the favorite. She appears on cards, prints, mouse pads, and magnets. Zany is just about as popular as Molly. She appears on cards, prints, mouse pads, bookmarks, and magnets. Geraldine was an instant hit. She appears on prints, mouse pads, bookmarks, and magnets. People who prefer more conventional renditions love Mr. Moose. He appears on cards and prints. Many girls think she is a horse and love her. She is also popular with women of a certain age. She appears on prints and mouse pads. Cat lovers think Pixel is special. He appears on cards, prints, mouse pads, bookmarks and magnets. ZIII is a stunning print with white mat and black frame. Great paired with Zany Zebra for a kid's room. ZIII appears on prints and mouse pads. Dolly touches the funny bones in lots of people. She appears on cards, prints, bookmarks, and magnets. If you prefer bears, this is a winner. I can see him running off a t-shirt. He is on cards, prints, mouse pads, bookmarks and magnets. See other acrylic designs in THE ART GALLERY. The pikas and other mountain mammals are especially suitable for products related to hiking and climbing in the mountains. The pikas, carrying their bundles of flowers, would also be great for more dainty applications. The original line of cards was developed from watercolors approximately 7" x 10" in size. Here are four favorites. 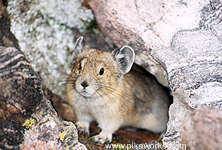 Esmerelda is the founding pika and the company logo. She appears on cards. Maurice appears on a card and as a small print. Esmerelda and her paintbrush appear on cards, bookmarks and a small print. Meandering Moose appears on cards and mouse pads. For years I have been taking photos of pikas high in the mountains in the western U.S. Here are a few. 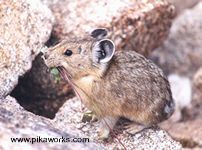 Also look through All About Pikas, Colorado Pikas, Pika Photos and the Pika Photo Gallery. Ask about any photos that interest you. Some are suitable for high resolution reproduction. Others work best at low res on the web. A couple of years ago, I had great luck photographing moose in the woods near home. I took loads of photos of Dolly and Molly a mother and yearling daughter. Ask about any that interest you. Also see Mt. Mansfield Moose, Moose Photos, and photos throughout the site. Joan MacKenzie would be glad to talk with you by e-mail or call (802) 879-1131.